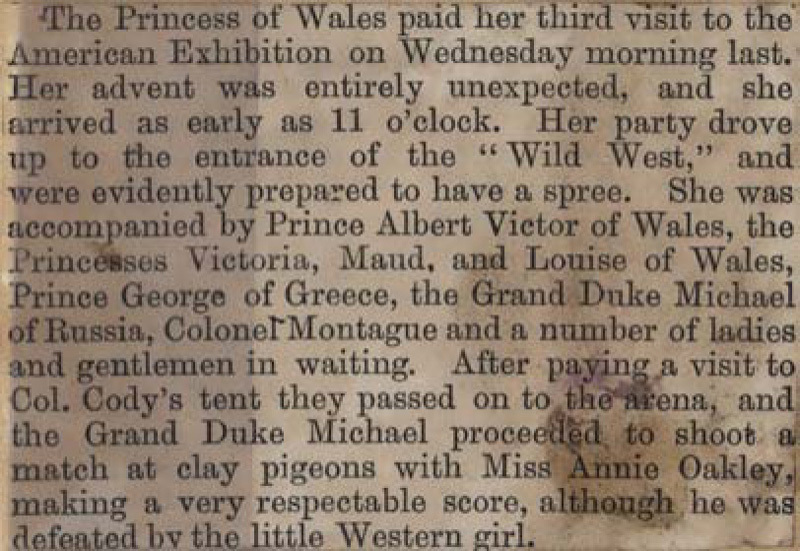 The Princess of Wales paid her third visit to the American Exhibition on Wednesday morning last. Her advent was entirely unexpected, and she arrived as early as 11 o'clock. Her party drove up to the entrance of the "Wild West," and were evidently prepared to have a spree. 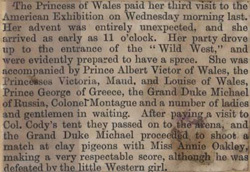 She was accompanied by Prince Albert Victor of Wales, the Princesses Victoria, Maud, and Louise of Wales, Prince George of Greece, the Grand Duke Michael of Russia, Colonel Montague and a number of ladies and gentlemen in waiting. After paying a visit to Col. Cody's tent they passed on to the arena, and the Grand Duke Michael proceeded to shoot a match at clay pigeons with Miss Annie Oakley, making a very respectable score, although he was defeated by the little Western girl.